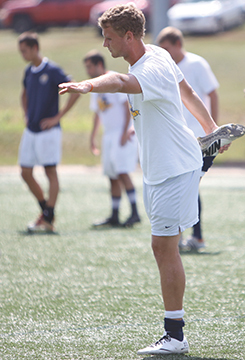 Junior defender Jacob Stieb joined the Webster University men’s soccer team in 2013. Head coach Michael Siener expected him to emerge as a team leader. Stieb scored the game-winning goal against Coe College (Iowa) in a 1-0 double overtime victory on Sept. 22. Stieb was fouled while carrying the ball down the sideline near the Coe goal. He decided to make himself a part of the free kick, when usually, as a center defender, he would stay back. Stieb volleyed the ball inside the six-yard box and scored his first goal as a Gorlok. Junior defender Tyler Thomas was at midfield and saw the play unfold. “There was just a big mess of people and I see Jacob appears out of everyone and started running back with his arms raised and we just kind of tackled him,” Thomas said. Stieb has played defense since high school and said his position has kept him from scoring goals. He called his celebration a classic defender reaction to scoring an important goal. Stieb said he was disappointed in his celebration because he just ran and didn’t take advantage of the rare chance he had. Stieb and Thomas played soccer for rival high schools. Thomas played for Triad High School (Ill.) but never realized Stieb played for Highland High School (Ill.). Thomas said Triad always got the best of Highland when the two played against each other. Stieb and Thomas met at Southwestern Illinois College (SWIC) where they became roommates and then defensive partners. “I went up against him a couple times and he stuck me a couple times. He got the better of me,” Thomas said. Greenville College (Ill.), where they both intended to play in 2013, is only 10 minutes from their high schools. Siener contacted the pair and gave them a campus tour in late May. Stieb and Thomas decided on Webster after that trip. Columbia College (Mo.) and Blackburn College (Ill.) were among the other schools Stieb and Thomas visited before deciding on Webster. Living together has helped the two develop chemistry in the backfield for the Gorloks. Stieb has started every game for the Gorloks at center back. Three other players have started next to him this year, but he said he is most comfortable playing with Thomas. Siener said the chemistry between Stieb and Thomas helps the team get on the same page. Thomas said he believes he will start with Stieb the rest of the season. -Sam Masterson contributed to this article.